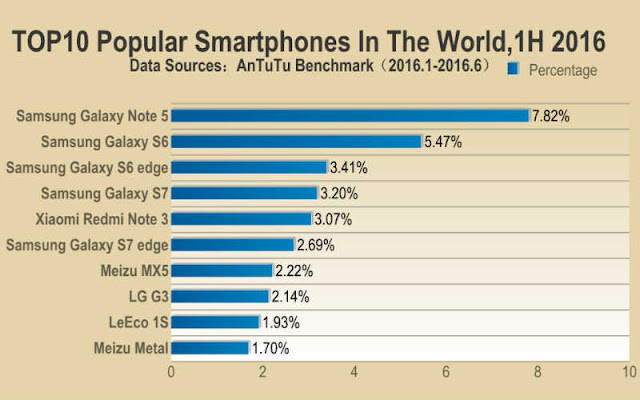 Samsung Galaxy Note 5 has emerged as the most popular smartphone in the world according to Antutu benchmarking app. Antutu, the popular mobile benchmarking app has announced its list of popular smartphones. According to the release, Samsung Galaxy Note 5 is the most popular smartphone globally, while Xiaomi Redmi Note 3 ruled the popularity index in India and China. Samsung dominated the list of Top 10 popular smartphones in the world with six of its devices in the list. Samsung Galaxy Note 5 was followed by Galaxy S6, Galaxy S6 edge, Galaxy S7. Samsung Galaxy S7 edge was the sixth most popular device. Samsung recently reported significant profit growth on the back of Galaxy S7 sales. The Korean smartphone giant is set to launch next Galaxy Note smartphone on August 2. While Samsung topped the list, the surprise element was Xiaomi Redmi Note 3. Xiaomi’s Redmi Note 3 was the fifth popular Android device, and was the most popular device in India, China, Hong Kong, Russia, Vietnam and Russia. Antutu uses its benchmark data to rate the devices. The popularity rating is for the first half of 2016. Antutu is currently the most popular benchmarking tool used by both enthusiasts as well as average user.